Having played their first two matches with a four-man defence, both sides switched to a back three for this decisive group game. This was almost certainly Italy changing to a back three proactively, and Uruguay doing so in response. Cesare Prandelli’s team selection, with three natural centre-backs and two full-backs/wing-backs, suggested this was his plan all along – but Oscar Tabarez had kept an unchanged side from the victory over England, when he used a midfield diamond. 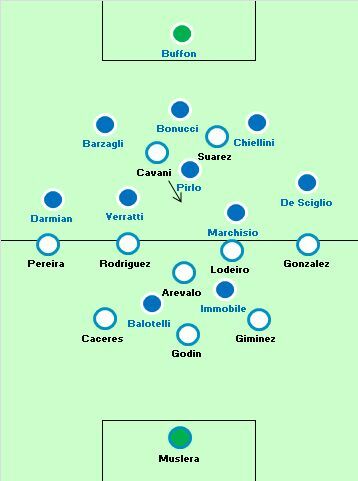 Tabarez is generally a very reactive manager, however, and upon seeing Italy’s teamsheet probably decided he wanted a spare man at the back, against the pace of Mario Balotelli and Ciro Immobile, so Martin Caceres was moved inside and Alvaro Gonzalez played the unfamiliar position of wing-back. The only reason Gonzalez would be selected to play as a wing-back, rather than the more natural Maxi Pereira, is if there was a late shift from Tabarez, having already name his XI. Had he intended to play this way, he surely would have played Pereira from the start – in the end, he brought him on at half-time. You can’t judge any match purely – or even primarily by formations alone. But if there’s one formation match-up that should be avoided at all costs, it might be 3-5-2 against 3-5-2. It tends to produce slow, frustrating matches with neither side capable of finding space in the opposition half – both sides have a spare man at the back, the wing-backs run up and down the line with one another all game so there’s no outlet on the flanks, and the midfields tend to cancel each other out. That’s roughly what happened here, although it wasn’t purely down to the formations. There was also the heat and humidity of Natal, which created a slow contest, and the fact neither side wanted to force the issue in the first half. Italy were understandably patient considering they were content with a draw, while Uruguay didn’t want to leave themselves vulnerable to the pace of Italy’s front two. Even then, the game was scrappy. Neither side had an obvious advantage in any one area, and some of the passing was very sloppy. Edinson Cavani dropped onto Andrea Pirlo, as he’d done on Steven Gerrard, stifling Italy’s passing. Things brightened up in the second half. Uruguay pushed higher up the pitch, with Maxi Pereira a more natural wing-back, driving forward down the right. Italy, meanwhile, made a defensive shift with Marco Paolo on for Balotelli (who seemed to have picked up a knock, and was on a booking) and tried to clog up the midfield. 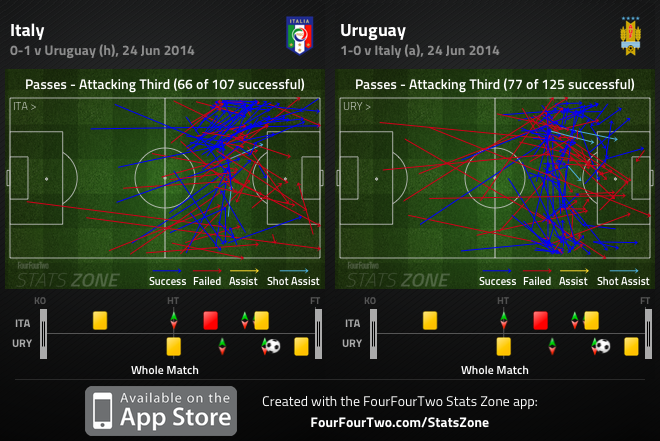 Uruguay’s only good moves in the game came from two similar situations, with one-twos down the left flank. On 32 minutes, Cristian Rodriguez cut in from the left, found Suarez, and he played a clever exchange with Nicolas Lodeiro before forcing Gigi Buffon to race out of his goal to close down the angle. On 57 minutes, Rodriguez played a great one-two with Suarez, before firing wide of the far post. There was a strong emphasis on Uruguay working the left flank throughout the game. Then came Claudio Marchisio’s red card, which meant the game took a different turn. Italy now played a defensive 5-3-1 formation, so Tabarez immediately turned to an extra forward. Christian Stuani replaced Alvaro Pereira – although it was strange Pereira was replaced, because he’s the ideal left-back when playing against ten men and needing a goal. Caceres moved out there instead, but didn’t offer much thrust. While Uruguay eventually found the winner, they did a surprisingly poor job of getting back into the game with an extra man. They didn’t stretch the play, their build-up play was extremely slow, and for long periods Cavani, Stuani and Luis Suarez waited up against Italy’s back five. Considering their ability in deeper positions, they surely should have been dropping deeper to help create opportunities. Prandelli’s decision to send on Antonio Cassano in place of Immobile was strange. Surely, as your lone striker with ten men, you want someone who will run their legs off for 15 minutes? Cassano at least offered more ball retention potential, which rather summarises Prandelli’s overall approach. In the end it took a set-piece for Uruguay to grab their goal, with Diego Godin making the breakthrough with a rather fortunate ‘header’ that actually came off his back, although his run and positioning was identical to his crucial, title-winning header at the Camp Nou recently. Italy went gung ho, chucking Gigi Buffon up the pitch late on, but to no avail. Costa Rica started strongly and had long spells of possession in non-threatening positions – they were happy with a draw, of course, and while their early passing and movement caused England problems at the back, they eventually settled down and slowed the game. They saw plenty of the ball in midfield positions, and inside their own half, but rarely looked likely to actually penetrate England. Their best goalscoring efforts came from long-range shots, or from long balls. Possession was even in the first half, but England stepped up and dominated after half-time, working the ball into the final third more regularly. This wasn’t exactly end-to-end stuff, though. There were twelve shots, with Daniel Sturridge having four of them and being denied another shot by a last-ditch Oscar Duarte tackle. 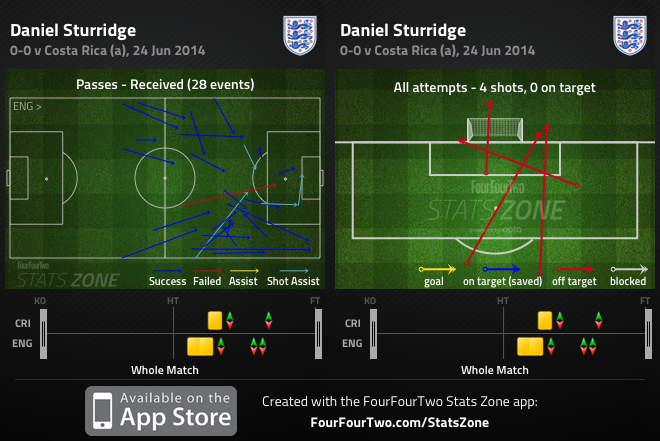 Sturridge is a strange player – even when he scores a lot, he seems to miss a lot too. He’s not an Inzaghi-style ruthless poacher who pops up once a game and scores, he’s more of a persistent striker who has five chances a game and scores one – his quality is getting into the positions, rather than being the most efficient finisher. Costa Rica’s defensive play was again excellent, however. They pressed less in midfield than against Italy, and therefore weren’t prone to balls played in behind the defence – they instead conceded pressure in front, and their solid five-man backline was impenetrable. It’s worth remembering they’ve only conceded once in this tournament – and that was a penalty. There was no great surprise in terms of the formation match-up here – it was 4-3-3 against 4-2-3-1. As in their first two games, Ivory Coast tried to push both full-backs forward up the pitch, with their two deepest midfielders dropping into the backline to protect the centre-backs. Greece were diligent in their tracking of the Ivorian full-backs, though, and neither consistently received good passes in dangerous positions. Serge Aurier, who was so threatening in the first two games, struggled to shake off the attentions of Lazaros Christodoulopoulos, who tracked him back and then sprung forward on the counter-attack nicely. Ivory Coast’s best cross of the first half actually came from Yaya Toure, who had drifted out to the right flank, and their most promising moments came on counter-attacks. Gervinho and Salomon Kalou both looked to cut inside and play one-twos with Didier Drogba, but as so often, they looked promising without delivering much end product. 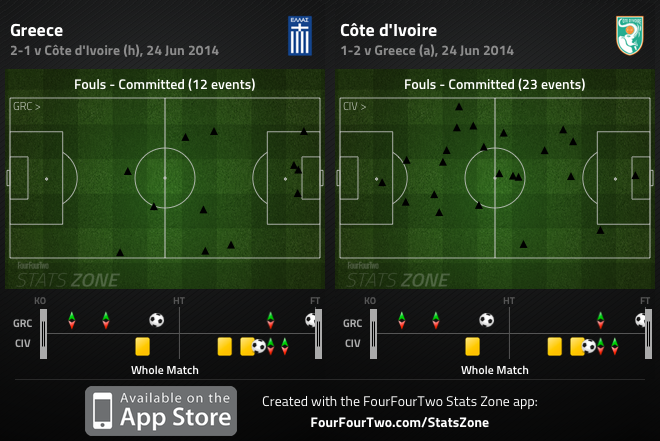 Ivory Coast’s approach was as expected, but Greece – needing to win the game, of course – were more ambitious than usual. 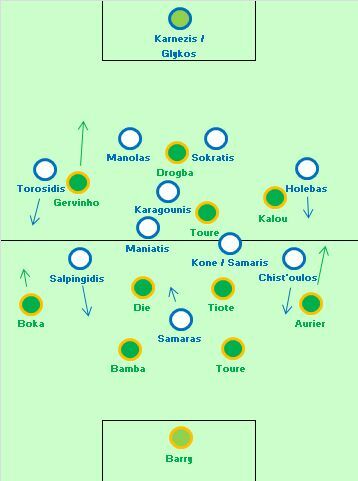 There was a major difference in the approach in midfield, where Greece pressed much higher up and often won the ball in dangerous positions, before quickly getting men forward and attacking into the wide areas, exploiting the fact the Ivorian full-backs were high up the pitch. This pressing was a crucial factor in the game, with Andreas Samaris dispossessing Chieck Tiote in an advanced position creating the opener. It wasn’t dissimilar from the way Serey Die lost possession cheaply in Ivory Coast’s previous game against Colombia, leading to Juan Quintero’s goal. Greece proved they were capable of counter-attacking from deep positions, too, especially into the second half when the Ivory Coast pushed forward, and Sabri Lamouchi’s side left even more space at the back. This was more reminiscent of Greece’s Euro 2004 efforts, because the full-backs often led the counter-attacking charge – Jose Holebas drove forward on the break in the first half and hit the bar, while Vasilis Torosidis was a force in the second half. Whoever won possession quickly looked to dart forward, and if they evaded the first challenge they often found they had 30 yards of space to break into, with runners supporting them too. At 1-0 up, Fernando Santos flipped his midfield. Georgios Karagounis started as the deepest of the midfield triangle, but for the second half played at the top, with the other two mobile midfielders dropping back. This was interesting, and shows the change in approach – at the start Santos wanted two to press, with a playmaker just behind. When he knew Greece would be under pressure, he wanted his functional players sitting deeper and protecting the defence. Karagounis played well in the advanced position, hitting the bar with a great long-range shot and playing neat passes to onrushing midfielders. Georgios Samaras also did excellently as the main striker, where his hold-up play is considerably more effective than when out on the left – this was a genuinely excellent performance. This was the third time Ivory Coast have gone behind, and the switch to the 4-2-4, with Toure dropping back into midfield and an extra striker introduced, is now familiar. It got them back into the game when Gervinho squared to Bony, and the Greek defence had real problems playing 4 v 4 at the back. That said, Ivory Coast left a huge amount of space to counter-attack into, and only a couple of near-misses – and a series of highly cynical fouls – prevented them from going 2-0 down. Lamouchi had to take risks, of course, but the second goal of the game could have gone either way. Arguably, Ivory Coast didn’t make enough of a defensive shift at 1-1. It’s a tough balance to find, of course, but they carried on attacking with four players and left the defence exposed, which was dangerous considering how well Greece were breaking from deep. The game, and the group, essentially came down to a late penalty decision. It was somehow fitting for the game – the Ivorians had repeatedly fouled throughout, and Samaras was a deserved matchwinner from the spot. Amazingly, it was his first international goal for two years. This was another frustrating performance from Japan – lots of possession, some pretty build-up play, but little in the way of penetration. Even more than usual, they needed to commit men forward to increase their attacking threat, so inevitably left gaps at the back for Colombia to break into, with Juan Cuadrado – the only first-choice attacker not rested – having another excellent game. 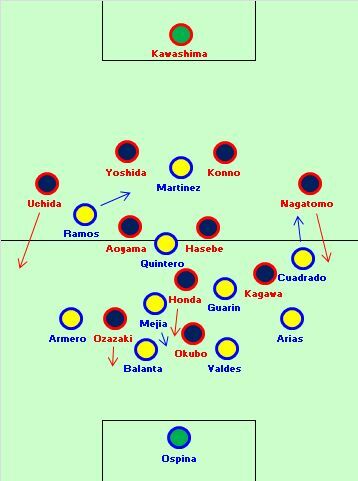 The only genuinely interesting factor was the positioning of Alexander Mejia, who on paper was a midfielder, but stuck so tightly to Japan’s number ten Keisuke Honda – who was determined to move forward to become a second striker – that he basically became a third centre-back. It meant Colombia retained a spare man at the back, and were generally comfortable despite having to withstand lots of pressure. Overall there was a slightly ‘false’ feel about the match, with Colombia playing a reserve side, and Japan lacking belief in the final half hour, when they realised the game – and the World Cup – was slipping away from them. In fairness, it was only in those final 30 minutes when this turned into something of a thrashing. Nigeria v Argentina – a point each would ensure Nigeria progress, and Argentina stay top. 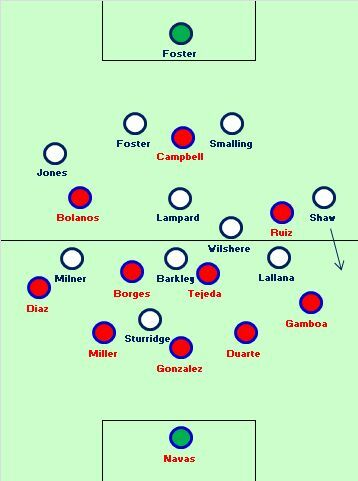 Not a particularly exciting game on paper – although if the sides play with freedom, the game could be OK.
Quick note, there’s a mistake on your England v Costa Rica graphic – Foster’s name shows up as the CB next to Smalling as well as in goal. I wondered if you were trying to make a statement about sweeper keepers, but then I figured that with the keeper in question being Foster, that was unlikely. i think the japan lost so badly because of their necessity to win it. I think they did pretty well and that they lacked a goal scorer in the final third.. But Columbian defence sat quite deep and soaked up the pressure and then broke quickly. They were getting overrun in the midfield and the introduction of james rodriguez changed the game because after that japanese midfielders needed to face an extra man in the midfield and makoto didn’t get much comfort on the ball.. in overall it was a good game of football. yeah.. that game was a really poor display..
Hannibal Lecter – Italy 1:0. As a fan of Italy and underdogs such as Croatia and Bosnia I have decided to stop watching the World Cup due to poor refereeing. Good luck to all Latino teams in their Copa America. Wow, sour grapes award of the World Cup so far. I guess you don’t like Holland, France, Germany, Greece, or Belgium and the rest must be beneath you. While I enjoy Holland and Germany I really do not like the rest. But my point is thanks to the refereeing in the World Cup I will be not watching 3 of my favorite teams, therefor not watching it at all. 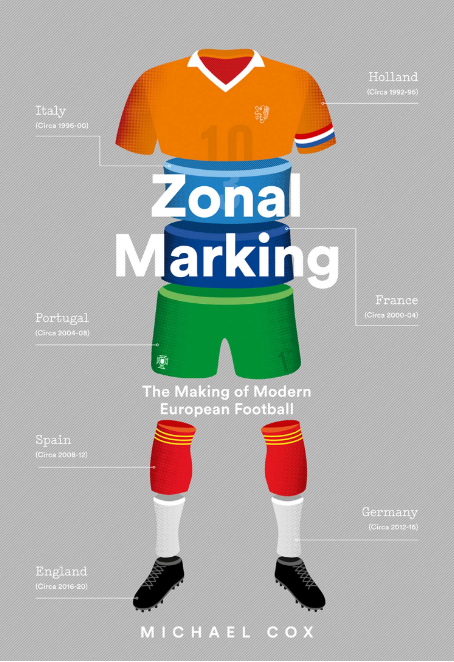 See I have nothing against if Italy or Croatia lost like Spain or England – by pure football. “Ins” also turned off the 1982 World Cup Final after the referee allowed Italy to make a free kick before the injured players gotten off the ground. He only learned about Italy’s victory the next day when reading the newspaper. I was not born at 82 yet. And I watched the game. Prandeli himself said that the red card changed the game. ZMs analysis claim the same. Basically the game drifted drastically after a poor red card decision. The Suarez, perhaps Urugway best player did not get send off for biting, and the goal came from a corner that did not exist. I agree with you on the poor refereeing. Srna from Croatia managed to foul inside the box and make a diving hand save on the same play without warranting a penalty call! Well you had a good run watching Euro 2006 and Euro 2010. 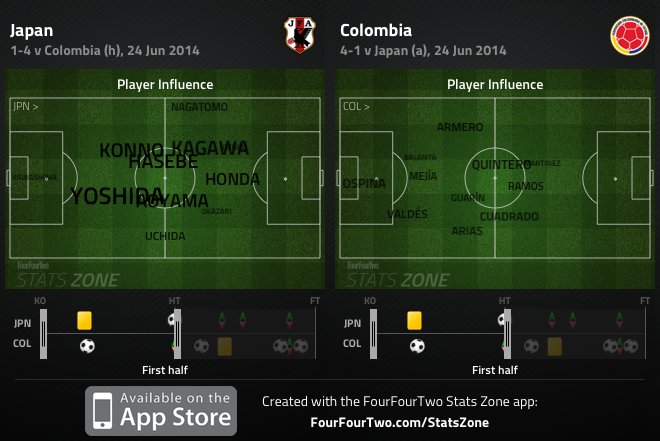 Superb Balanta effort: his powerfull interceptions caused 1st and 2nd Colombia goals. I can accept that neither the ref nor the linesman saw Suarez’s bite, but come on, Marchisio’s red card is completely ridiculous. If such tackles are to be punished with red card, Mexico, Uruguay and Brazil should finish their matches with 8 players. I wonder if what fifa wanted to avoid was a Brazil VS Italy quarterfinal in order to ensure the hosts’ participation in the semis, or it was simply another incident of the fifa against uefa declared war. In any case it is an insult towards all the world football funs to expel one of the tournament’s favorites with such a scandalous decision. It was a poor challenge, but the inconsistency of decisions is something Nikos touched on and is highly frustrating. 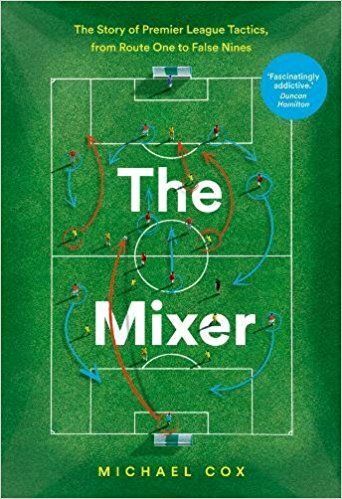 Every referee seems to have his own book regarding when to give the first yellow card, the perception of cynical tactical fouls, shirt pulling in the box and off-the-ball conflicts. How was it a leg breaker. In my opinion Marchisio just tried to cover the ball and it just happened to make the foul. This player is so humble and judging by his reaction and how he hugged and apologized to Prandelli can completely describe if he did try to break his opponents leg or cover the ball. Def not a red card. Very dubious refereeing. Actually the Italian tv even proved that there was no corner in the corner decision from which the goal followed. it was a poor refereeing decision , at most that challenge only deserved a yellow – hey it was not two footed and marchisio didn’t even stretch his legs to kick out at the player – it was a ridiculous red card and the referee really ruined the game. i agree with nikos if that challenge was a red card then lot of other teams would be down to 10 or even 9 men. you can’t help but think that this was a setup. you haven’t seen a sliding tackle that takes off both opponent’s legs which is happening in every game – now that’s an ankle breaker but we don’t see referees giving any card for those. Unlike in previous editions, there are no great defensive teams in this tournament. None. Individually and collectively, the defenders aren’t great. Thiago Silva, the world’s premier defender, is stuck with the world’s frizziest albatross as his partner. Individual skill, excellent coaching in the tactical and man-management fields and team cohesiveness will decide this tournament. De Gea, Carvajal, I. Martinez, Ramos, Moreno, J. Martinez/Ander I., Ander H., Thiago, Muniain, Isco, Costa. I think that with Del Bosque at helm during this WC, spain luck wouldn’t have faired that great. My conclusion from Spain’s last match (which they won 3-0) is that the whole elimination is basically on him. His heart got on the way of reason, fielding too many midfielders, many of them redundant, as well as having unproven (spain-wise) and injury battling Diego Costa as a starting. It’s imposible to tell but I have the feeling that a classical 4-4-2 with villa and torres/pedro upfront, and a selection based on players with the best form on all of the following lines would at least made them more competitive. I also think lacking someone like navas, who has the ability to penetrate is something the surely missed. Agree with you. Spain’s poor performance is on Vicente Del Bosque and maybe a bit on Casillas too(whether he was paid to perform bad is one possibility). He used too much redundant midfielders like Iniesta, Cazorla, Mata, David Silva instead of calling different type of midfielders like Jesus Navas’s penetration and wide play or Gabi’s energy and tackling for the midfield battle or Raul Garcia’s phisicality and aerial prowess. More than that, he forgot to think on forwards like Fernando Llorente, who is better at holding the ball than any of other strikers or Negredo and Soldado whose combination of phisicality and finishing are better than Fernando Torres. The coach should have realized that he couldn’t bet all his cards at Tiki Taka style anymore according to Barcelona and Bayern Munchen’s performance at Champions League. For sure that style is declining and teams have realized how to counter that type of game. There’s obviously no plan B in Vicente Del Bosque’s squad, but only Tiki Taka. He should have tried Atletico Madrid’s tactics like their way of pressing at midfield and their counter-attack approach at Spanish team, because it was not coincidence that team have won La Liga and have been runner-up at Champions League. So thinking in that way, I would choose for my spanish squad would be 4-4-2: De Gea, Carvajal, Sergio Ramos,I. Martinez , Jordi Alba; Isco,Gabi,Javi Martinez,Koke; Raul garcia, D. Costa. Change to plan B : De Gea, Carvajal, Ramos, Javi Martinez, Jordi Alba; Thiago Alcantara,Koke,Isco;Iniesta,D.Costa,Pedro. Other important subs: Llorente, Jesus Navas,Negredo,Xabi Alonso. They would have fared bad, quite simply. You can’t possibly expect the chemistry of a team to be built in a few months (i.e. few games)and we can’t expect a complete change of style to be fruitful in such a short time span. You also can’t dismantle a team that won the European Cup two years ago, just on the ex ante hypothetical assumption they might not fare well. Now they failed, one can discuss renovation. That’s not Del Bosque’s fault, any reasonable coach would have done the same as he did. I also can’t understand these attacks on one of the most successful coaches in recent history, he’s won basically everything wiht club and country. With great teams, granted, but then many coaches have great teams and win nothing at all. So? italy just went with a negative attitude they wanted a draw at the same time they knew that the opposition wants a win and they knew that the opposition would try to press them . i think prandelli had a good tactics in mind he thought the opposition would press and that they would find space behind the defense . the second thought of playing immobile was that he is good header of the ball and a poacher . he had his wings backs going forward and them crossing would had created problem for uraguay . but uraguay countered it very nicely they played deep so any space behind was denied . the one on which pirlo thrives on. he is very good on throwing ball behind defense and balotelli to chase it . but uraguay had caceras who is very good defender ( watched him play for sevilla ) he got tight on balotelli and denied him time on the ball . balotelli is good for three things first he is good to chase the ball . second he has a good shot from distance and run with the ball and third like his spanish counter parts very good at play acting . the problem that italy had with whole tournament had been the playmaker . they never found one who could play between the lines and release a player or get beyond the striker . prandelli playing two striker thought of those two combining but it never happened . he should had moved veratti up the field and started motta in place of marchisio . now i am not criticizing marchisio for his red card infact i had been criticizing him even in the juventus matches as well as even in the last euro you can check my post over there . now having talked about the italy match how about authors favourite england . every team had a game plan . every team had cohesion and most importantly every team had discipline and organisation .team like showed that against a side like argentina . at one time england coaches were hired for this quality . i think hodgson too was hired for his tactical onus and organisational skills . a team may not be very technically brilliant and have flair players but the discipline sets them apart . there was no game plan in terms of england . even the author had failed to formulate one . i think it is time that hodgson should walk . prandelli did that with dignity but look like hodgson has that habit of getting humiliated .